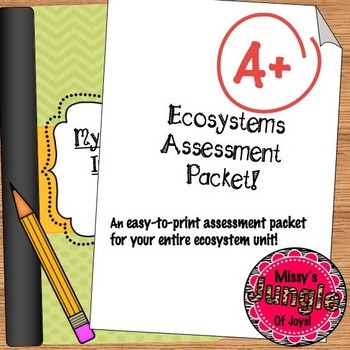 This product was made to be used by itself, or with the Ecosystem Interactive Notebook Package, or Review Rock: Ecosystems Musical Scoot Game. Just click on the links below! Review Rock! The Ecosystem Musical "Scoot" Game! 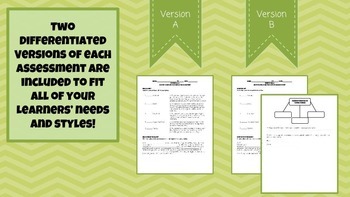 -Two differentiated versions of each assessment (Labeled A or B). than the version labeled “B”. -The review sheets are the same for both A and B versions. -Answer Keys for both A and B versions of each assessment. I. What Are the Parts of an Ecosystem? What Are Examples of Biotic and Abiotic Factors? What Are the 7 Characteristics of Living Things? What Do the 7 Characteristics Mean? 7 Characteristics: What Would Happen? What Does a Habitat Need? What Are Some Examples of Terrestrial Biomes? What Are Characteristics of Terrestrial Biomes? What Are Some Examples of Aquatic Biomes? What Are Characteristics of Aquatic Biomes? What Are Limiting Factors in an Ecosystem? II. How Do Organisms Interact in Ecosystems? How Are Energy Roles in Ecosystems Classified? What Are The Energy Roles in Ecosystems? What Are The Different Kinds of Consumers? How Do Producers Get Energy? How Does Energy Move in a Food Chain? How Does Energy Move in a Food Web Chart? How Does Energy Move in a Food Web? Where Can I Find Food Chains in a Food Web? How Does An Energy Pyramid Depict Energy? How Can I Create My Own Energy Pyramid? What Are The Different Types of Symbiosis? III. How Do Ecosystems Change? What Environmental Factors Change Ecosystems? How Do People Change Ecosystems?